Mortise locks are a bit different than your standard tubular latch type locks that are most commonly used in residential applications. You can see to the left what the mortise lock box looks like. Before you order a mortise lock, be sure that your door is prepped correctly for the lockbox that is used. 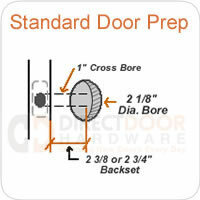 Most doors are prepped for tubular latches which require a bore hole and cross bore. Mortise locks require box to be mortised out of the edge of your door that is around 6" tall and 3 1/2" deep to allow the mortise lock box to slide into the door.